When the financial world crashed years back, we decided to take a look at how to spend money more wisely. Here are some of the things we did that saved us cash. As you will see, this was a “one step at a time” approach. There was no real way to save tons of money on one particular thing. 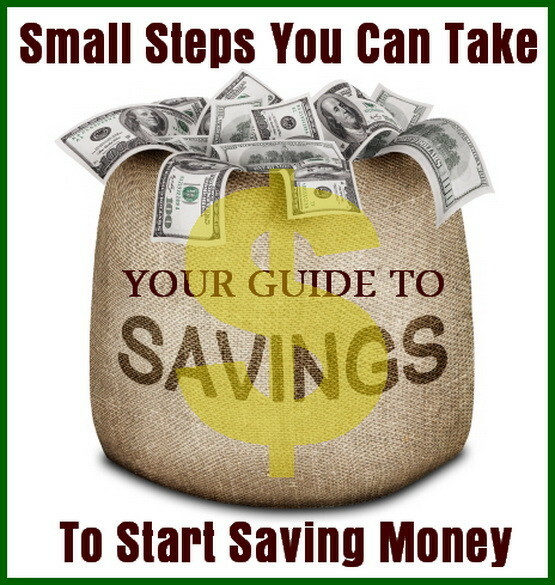 So in time, and taking small steps, you can start saving money little by little by using some of these tips and tricks below that will work for you. These money saving steps are guaranteed to work for you if you have patience and a real motivation to save. START SAVING MONEY TODAY – WAYS TO SAVE MONEY! Car insurance rates can get high with only one speeding ticket. If you have 1 or 2 speeding tickets from years ago, they still may be affecting your insurance rates. Be mindful of your speed when driving and leave a few minutes earlier. See about ways to lower your insurance rates. When purchasing clothes online, always search for promo codes to get a % percent off of your total purchase. Here is an example of using promo codes on Old Navy online. Sell things you do not use on Craigslist. Search through closets or your garage and find things you will never use again. It is also a good way to declutter and minimize how much junk you have lying around. Switch banks to get no ATM fees. Many times banks will have promotions that allow free checking and savings accounts forever. A credit union may be best as they offer no fees and low interest on loans. Save all of your loose change in an old coffee container. Once it is filled to the brim, take it to a Coinstar machine and get CASH! Call your credit card companies that have yearly fees. Ask them to waive the annual fee. They have done that for the last 3 years straight by simply making a 15 minute call. Switch your Auto and Home insurance companies into one company or agency. By doing this you can get huge discounts on insurance consolidating. The multiple policy discounts through one agency saved us about $700 every year. Change your cell phone plan to only what you actually use. If you are not using all the mobile data every month, then switch to a lower data plan. You can also see if switching to Sprint will reduce cost as they are currently offering a CUT YOUR EXISTING MOBILE PHONE BILL IN HALF deal. They will also pay your termination fee from your existing carrier. If you buy small items such as books and certain necessities online, consider signing up for Amazon Prime. You pay a yearly fee but you will never have to pay for shipping again. This also allows you Amazon Streaming Video which is similar to Netflix. You could then cancel Netflix and save even more. Do not eat out as much. Plan good home cooked meals at home. When you go grocery shopping, use coupons and choose what you need wisely. Cooking in bulk and freeze the extras for another night. Leftovers for dinner on nights you work late is faster and cheaper than waiting for pizza delivery. Be flexible while traveling. Check 1, 2, or 3 days before and after the days you want to travel and come back. (Tuesdays and Wednesdays are usually the cheapest days to fly) Many times you will see a huge reduction in flight ticket prices. Also, when waiting for your jet in the terminal, ask to be put on standby. If the flight is overbooked, you will get bumped, but they will usually give you vouchers for up to $500 for your next flight. You will then either fly out that same day or the next day on the earliest flight. They will also sometimes put you up in a hotel for the night to wait for your flight for the next day. Limit the number of times you go to Starbucks. $5 bucks a coffee 10 times a month is $50 dollars. Buy Starbucks coffee for home and make it on your own coffee maker. Buy a plastic Starbucks coffee sipper if you really need to FEEL like you are drinking coffee fresh from the store. If you read books, go to the library instead of buying books. Libraries have a pretty huge selection these days. They even have e-books, video games, and movies. Use their website, reserve the items you want and go pick them up. Ride a bicycle instead of driving. If you are going to the local corner store for a few items, ride a bike instead of driving! Turn down thermostats when you’re not in your house for air conditioner and or heating. It makes a surprisingly large difference. Buy a programmable thermostat and program it for maximum energy savings. When going away for some time, unplug electronics not in use. If you are gone for 5 days, do you need your modem and router to be on? Use coupons on items you already buy as there are many websites that have printable coupons and even ones you can use with your mobile smartphone just by showing it at checkout. Buy generic store brand items at the grocery store. Usually the products are almost exactly the same but just have different packaging. Reduce your cable bill by asking to bundle or removing items you hardly use or don’t want. (Reduce cable bills) Call them and ask for any promos they may be having and see if those promos will last for over a year. When booking hotels, always shop around first. Many hotel chains especially Marriott have a lowest rate guarantee. Check at least 5 different travel websites first. Then call the hotel directly and ask about the same dates to see if they are cheaper. It’s free and you may get reduced room rates and coupons to see free shows and free meals. The casinos will usually give you $10 to $20 in free gambling credits too! Remove any unneeded extra weight from your car or truck. Taking out 100 lbs from your car increases fuel economy by 1.3%. Drive with a half tank of gas as every single gallon adds seven pounds to the weight of your car. Research purchases of appliances before spending the money. Read appliance reviews. Sometimes purchasing the more expensive unit is better than continually replacing a cheaper model. Get your oil changed and check your fluids & tires on your vehicle regularly. Clean or change your air filters in your home as this will help your air conditioner run more efficiently therefore saving you money in electric bills. Get regular dentist checkups to avoid huge costs in the future. Turn your hot water tank down a degree at a time until you find the best temperature. Best temperature for your water heater? Use old clothes as kitchen rags cut them up and use them over and over. Unsubscribe from all the store emails you get every day as they tend to make you purchase stuff you DO NOT NEED. Get a membership to Sam’s Club or Costco and buy huge bulk to save on spending little by little at a normal grocery store. Also save on gas as you won’t need to drive as much to go purchase items. Energy efficiency is key. If you buy a new appliance, buy an energy efficient one. Your local power company may give you a rebate check for purchasing an energy efficient appliance. You have to fill out a form and send a copy of the receipt and they will send a check. There are a lot of rebates on things like refrigerators, freezers, washer/dryers, and even shower heads and lighting. Turn off lights and other items when you are not in the room. Install weatherproofing on your doors and windows to keep the outside air out when the temperatures are extreme. To really save money, do this.. If you know of any other money saving tips to try, please leave a comment below to help our other readers use your help to save even more money. Shower caps are great to cover left overs that are in a bowl or on a plate. Stop purchasing sandwich bags and expensive freezer bags. In meat dept at Costco grab a dozen of their clear plastic bags off the roll. Those bags are thick and strong to use as freezer bags. Employees at Costco didn’t mind me taking them. I bake a lot and freeze my goodies. In hardware store where they have nails in bulk there are some really thick bags there that make excellent freezer bags. No freezer burn will get through inside those bags. Lastly where a grocery store have the fruit and veggies there are lots of bags to put your food into. Grab what u need and then a handful. Instead of buying food for rabbits and other animals that eat ruffage. Go to the grocery store and ask the grocer if they have any fruit and veggies they can’t sell. It’s free and u save tons of money. Wait a minute, within an article on ways to save money you suggest someone use a coin counting service (Coinstar) that charges a 10% fee! Doesn’t that seem rather counterproductive with the intent of the article? True, the rate was lower when we wrote the article. However, most people do not have extra time to get the paper rolls and put the coins in them. If time is money, then use the Coinstar. If you have time to kill, then you can use the paper coin rolls and take them to the bank. Our intent was to save $ but also be efficient.